August is the month when the biggest Beer Festival in Britain hits London. The Great British Beer Festival – or GBBF – attracts around 55,000 drinkers over a 5 day period, offering up to 700 different cask ales, and a plethora of ‘foreign’ bottled and keg beers. Every year there is a theme, (always good to have a theme at a Beer Festival). 2014’s theme was ‘The Circus’. Not quite sure why, other than the visuals were quite spectacular, and it gave an excuse to name each of the bars after a circus act – trapeze, circus ring, acrobats. It was all a bit random, but in a good way. GBBF is one of my favourite beer events of the year. Not just because of the huge variety of beers available but because of the people who attend. If you want to attend an event which covers every type of demographic – young, old, male, female, black, white, slightly bonkers to the totally deranged, you’ve got to come here. We already know that Beer Festivals are a great way of introducing non beer drinkers to cask ale in a sociable and non-judgemental way, and this is the biggest of them all. It’s a bit beyond bonkerdom to be honest. The Festival is held in a huge hall at Olympia in which sound and speech bounce around, a bit like in a giant swimming pool. Everyone who works behind the bars at the Festival is a volunteer. They don’t get paid and they work 12 hour shifts – minimum. They come from all over the country, and they all do it ‘for fun’. Yes, you read that right, they give up 5 days of their hard earned annual leave to stand behind a bar in a venue resembling an aircraft hangar and serve beer to over 55,000 visitors. And they clearly love being a part of this ‘real ale revolution’ and being involved in one of the biggest events in the beer calendar. A trade day kicks off the Festival and brewers from across the land network feverishly. It’s business as usual for the first couple of hours, then all those people who you’ve met formally across a desk in a meeting room become your best friends. You bond over your love of beer and notes are compared, beers recommended, rounds bought in. It’s a suspension from reality and the commercial cut and thrust of everyday life. 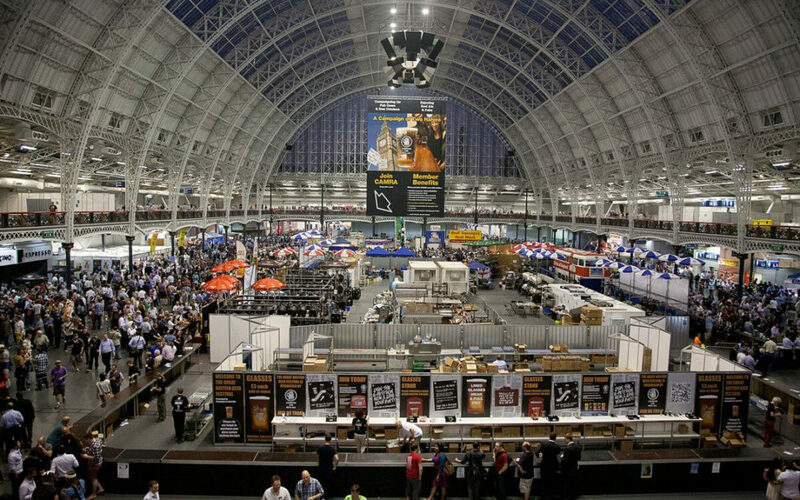 It’s a light bulb moment for every licensee, brewer, pub company area manager and PR guru: could we work in any other industry which throws us together in such a supremely social environment as the GBBF? I can’t imagine, for example, the toilet roll industry, or the pet food conglomerates having such fun at any of their annual conferences. Which brings me to the beers. Don’t try and make sense of the way the beers are laid out. It’s futile and it wastes valuable time. Similarly, just as the programme is professionally and well laid out with tasting notes for every beer, just stick it in your back pocket and only bring it out when you’re feeling a bit ‘Billy No Mates’ because all your friends are trying to find the loos/playing bar games/in search of food. Don’t get stuck talking to random bloke who wants to discuss the intricacies of single hopped beers. There is a reason he is on his own. And there is no escape. Take your time to wander round when you arrive and check out all the beers you would like to try. It’s not a trolley dash – the beer will still be there when you come back. If you’re lucky. Embrace the atmosphere. Not everyone will be your cup of tea but you could say that about the regulars in your local pub on a Friday night. Everyone at beer festivals has a shared love of beer and they’re there for a good time. So make some beer-friends! Visit the cider bar. Beer Festivals are very diverse (it’s not ‘all beer’) and cider is usually the category that sells out the quickest. Probably because you’ve dragged along non beer drinking mates and they’ll be totally stunned by the range of amazing real ciders on offer. Proceed with caution. You might be thinking “why does this blog matter? GBBF is a once a year event”. Well, everything that GBBF does well can be replicated on a smaller scale in any pub, club or even carnival and fete. Get your offering right; a good selection of different beers, some entertainment, great food and you’ve got yourself an event that beer and non beer drinkers alike will want to come to. My highlight of GBBF this year was seeing the Skinners crew from Cornwall march into the Festival hall dressed as Stormtroopers from Star Wars. There was no rhyme or reason as to why they were all dressed up as Stormtroopers, especially as they were led by a transvestite bloke dressed up as a buxom barmaid. You suspect this was a plan hatched up in the pub on a Saturday night after a few beers. But it kind of all made sense in the context of a totally bonkers beer festival.